Everyone knows that real SEOs work in Excel! Microsoft excel is an incredibly useful program - an electronic spreadsheet program that people use for manipulating, organising and storing data. Specifically for SEO, Excel can help straight from your initial client keyword research, through to linkbuilding and exporting reports from your favourite software. While a totally vanilla Excel is still useful, you are restricting yourself by not taking advantage of some of the plug-ins designed for Excel. The first one is SEOtools by a Swedish developer Niels Bosma - which can be found here: http://nielsbosma.se/projects/seotools/. Easy to install, and intuitive to use, SEOtools will allow you to pull in various search metrics such as Google Pagerank, key on-page factors like H1s or Title tags, and social metrics such as Facebook likes. Another extremely useful plugin is Excellent Analytics - A tool which pulls in data directly from your Google Analytics account. 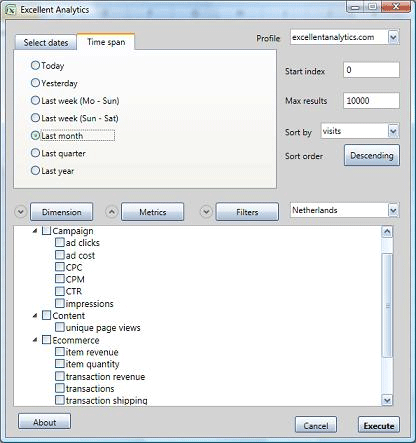 The possibilities are endless with this tool; create a multitude of queries with all the metrics available in Google Analytics, organise your data with pivot tables, combine data from more than one source, etc. .....and the best thing about both of these tools? They're free!